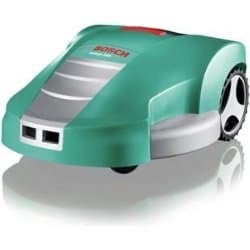 To make sure your Bosch Indego robomower is kept in the best condition throughout the mowing season there will be a few jobs you need carry out from time to time. And don’t worry they are nowhere near as time consuming and, I guess, annoying as installing your mower. They are all very easy to do and should only take about 5 minutes. But just because they are easy to do does not mean that you can just forget about them. They are all contribute to the health of your mower and therefore, your garden (and I know that’s all you really care about). So for your gardens sake, please carry these out whenever needs be. As with all mowers, you are going to have to clean it from time to time. Over the season it will begin to gather grass in its wheels, blades and over its body. Leaving it there can seriously affect how well the Indego maintains your lawn. Clear out all the grass and debris gathered together around the blades using your hands and a dry brush (be careful with the blades!). Check and clean around the front caster wheels (again using a dry brush or a cloth) and make sure that they’re able to rotate and turn. Then do the same for the back driving wheels. Flip the mower over with the wheels on the ground and give it a little shake to get all the remaining debris out. Now begin cleaning its body using a bucket of water and a cloth. Make sure you don’t use a power cleaner or a hose as they will probably damage your mower. And that’s it you are good to go. The Indego will now run much smoother, but be sure to clean it again in about a months’ time or when you begin to notice it running a little slower than usual. Now you may not have thought that you would’ve needed to do this but Bosch have said that it will reduce risk of the Indego docking incorrectly. It only takes two minutes so shouldn’t be too much hassle anyway. All you need to do is clean off (using a dry brush) any grass or dirt on the baseplate and around the charging contacts. So yeah nice and easy. To make sure you blades are kept in prime condition and keep your lawn looking its best throughout the mowing season, Bosch have recommended that you replace the blades after winter. But I would also give the blades a little check each month just in case they’ve been scratched or damaged. This would only really happen if the Indego ran off course into some fencing or trampled over an obstacle like a stone or toy. So you would only really need to check it because of that but I would check them monthly just to be on the safe side. Put on your gloves and flip the Indego over onto a soft area with open space. Get a screw driver and remove the blade. Now get your new blades and attach them to the mower – remember you will need to replace the old screw as well. Make sure the screw is fasten firmly so the blades remains attached but can also spin freely. Now flip over the mower again and you’re all done. And that’s all, now you can let it get back to work. Also, be sure to check out Amazon for spare blades. They will give you a better selection and much better prices. To make sure your Indego stays safe throughout the winter and remains fully functioning during the mowing season, there will be a few things you’ll need to do. And I will specify them below. Bosch have recommended that you allow your Indego to fully charge in the docking station before storing it for winter. This will ensure that your Indego is ready to go at the beginning of the new season. Also, by setting the height of cut to the max setting the Indego will be easier to store and will be ready to cut the grass at the beginning of the new season. Although the Indego is able to cope with rain and cold conditions it is recommended to store it somewhere dry and out of the reach of children (like in storage room in the house). However this is mainly to prevent it from extremely cold conditions like frost and snow where the electrical system will most likely be damaged. When the grass starts to grow again in the new season, you will need to prepare the Indego for cutting. Bosch have recommended you repeat the steps detailed above when you need to clean your mower. This makes sure there hasn’t been a build-up of dust over the winter and that all key components still move freely. Please follow all of the tips above properly. They have all been recommended for a reason and will have an impact on your garden so don’t neglect them.